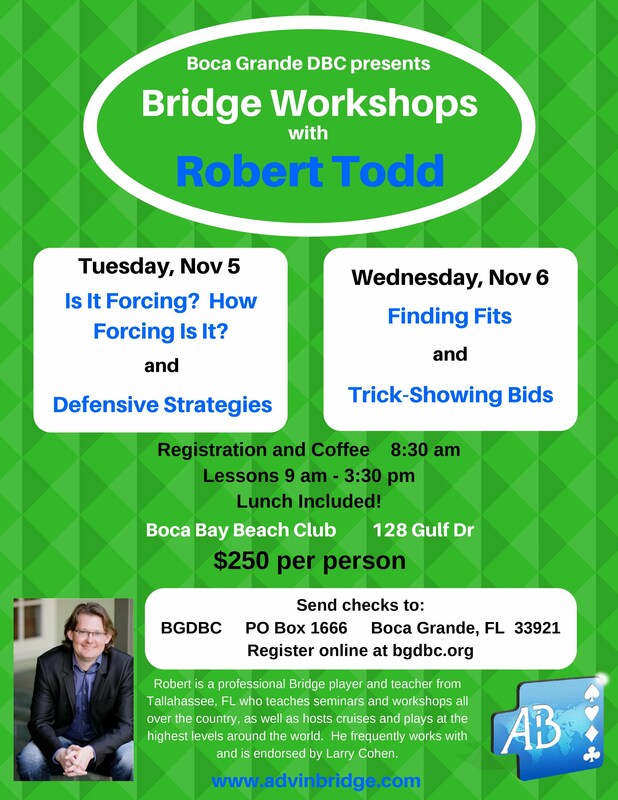 Welcome to the Home Page of the Boca Grande Duplicate Bridge Club! Game time will be at 1:00 pm every Monday & Wednesday and will start promptly. Be in your seat 15 minutes before game time. No food is allowed. Please remember to be respectful of this facility. Our seating capacity is 24 tables. Reservations will have priority over walk-ins. For more information check our FAQ(Frequently Asked Questions) or send an email message to our help desk. Master Points will be awarded. * ACBL Zero Tolerance Policy. Click Here for a demonstration of our duplicating machine. Gasparilla Inn & Beach Club: 451 Gilchrist Blvd. Boca Bay Beach Club 128 Gulf Blvd.